Height 5 feet 6½ inches. Weight 142 lbs. Chest measurement 33-36 inches. Complexion fair. Eyes grey. Hair light brown.Eyes both 6/6. Hearing good. Colour vision correct. Limbs and chest well formed. Full and perfect movement of joints. Heart and lungs normal. Teeth fair. Free from hernia, varicocele, varicose veins, inveterate or contagious skin disease. Vaccinated. Good bodily and mental health. No slight defects. Tattoo on left wrist (bracelet). On his way to War, Thomas was affected by pyrexia. In March 1917 he was in hospital at Cairo, suffering from malaria and influenza, He has many visits to hospital in the first few months of 1917. 5 November 1917 he went to hospital, having been wounded in action. Thomas Ryce Kennedy, known as Tom, was the younger son of Michael and Ellen (née Rice) Kennedy, of Winchester and later of Murray Street, Temuka. Michael and Ellen were both from Ireland – Michael from Tipperary and Ellen from Kerry. Born on 17 August 1892 at Winchester and baptised on 11 September following in the Temuka Catholic Parish, Tom was educated at the local school, Winchester Public School, before finishing off at the Marist Brothers School in Timaru. At Winchester School in 1902 Tom won one of the Standard III prizes. The prize-giving, held in the school committee chairman’s paddock, was followed by a feast of sandwiches, confections, etc., and a variety of sports. He was a very keen sportsman, being a good rifle shot, and participating in athletic sports, proficient especially in boxing. Thomas Kennedy was one of a number of Territorials and Senior Cadets who were fined in August 1914 for failing to attend evening drills, his fine being 20 shillings. He did have experience before the war with the 8th South Canterbury Mounted Rifles. Then, on a Saturday evening in April 1915, along with 122 other locals, T. R. Kennedy of the 8th Regiment of the Sixth Reinforcements, left Timaru by special train, en route for service at the front. The Mayor wished them “the best good fortune that could possibly befall them.” He complimented them on the “manly stand they were so freely taking in going to help to break the sway of one of the greatest despots who had ever lived.” Up till this time Thomas had lived at home and been employed in farm work, on his father’s or a neighbouring farm. 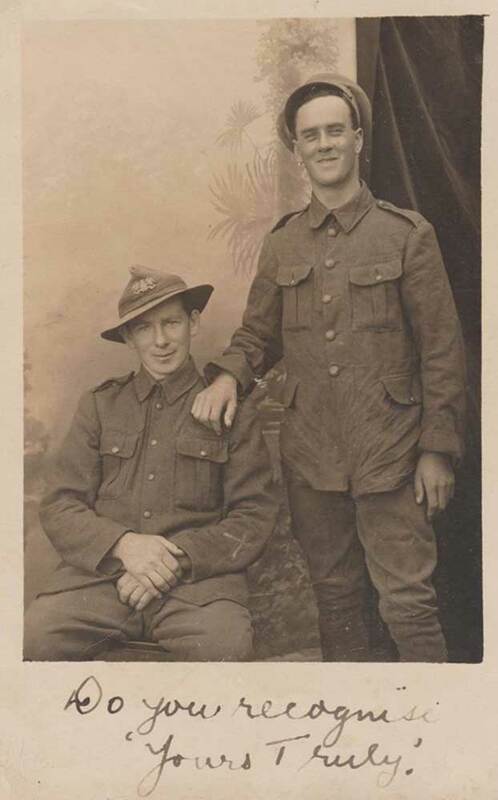 Before long – on 14 August 1915 – he was on his way to Suez with the Canterbury Mounted Rifles. On his way to War, Thomas was affected by pyrexia and was admitted to hospital on arrival at Cairo. He contracted fever at Gallipoli and was invalided back to Egypt. In March 1917 he was in hospital at Cairo, suffering from malaria and influenza. He had many visits to hospital or casualty clearing stations in the first few months of 1917. Thomas Kennedy saw active service at Gallipoli and in Egypt. At the capture of Beersheba he suffered wounds which sent him to hospital. The next day, 6 November 1917, at the age of 25, he died at Beersheba Hospital, Palestine, of those wounds. His mother by then living at Orari, received a cable to this effect on about 13 November. The report had been made by the Officer Commanding Anzac Receiving Station. The Timaru Herald casualty list gave his name as Thomas Royce Kennedy. A week later, in the Temuka Leader, Mr and Mrs Kennedy acknowledged the messages of sympathy received from their kind friends and the Orari Patriotic Committee. Tom had been very popular and was much missed by his many friends. A death notice – For the Empire’s Cause – appeared in the New Zealand Tablet of 6 December. On the first anniversary of his death, an In Memoriam notice was inserted in the Timaru Herald by his loving sister. This was likely Rhoda, the only sibling found at home with Tom in 1914. She had accompanied Tom when he returned to Trentham in June 1915. “God favoured our hero brother, when He ended all his pain. But we never once thought when we kissed him good-bye, that he’d never come home again.” For some years his parents inserted an In Memoriam notice in the New Zealand Tablet – for Trooper T. R. Kennedy, the second beloved son of Mr and Mrs M. Kennedy, Temuka. His medals (1914-1915 Star, British War Medal and Victory Medal) were sent to his father and the plaque and scroll to his mother after Michael and Ellen had retired to Murray Street, Temuka. Thomas Ryce Kennedy was buried in the Beersheba Military Cemetery, Palestine, Israel, the Rev. H. R. Gordon, Chaplain to the Forces, officiating. Thirty-one New Zealanders are buried in this cemetery which was created on the fall of Beersheba which was attacked on 31 October 1917. A memorial is worked on his parents’ stone in the Temuka Cemetery. His name is inscribed on the Timaru Memorial Wall, the Basilica of the Sacred Heart Memorial, the Geraldine War Memorial, the Temuka RSA Roll of Honour, the Temuka War Memorial, the St Joseph's Church, Temuka Memorial and the Winchester War Memorial. The Temuka St Joseph’s Church Memorial, an “exceedingly beautiful” monument to the memory of those who had fallen in the war, was unveiled after a Memorial Service on 25 April 1922. During the service appropriate music was provided by the choir and an excellent address was delivered by the Rev. Dr. Kennedy. 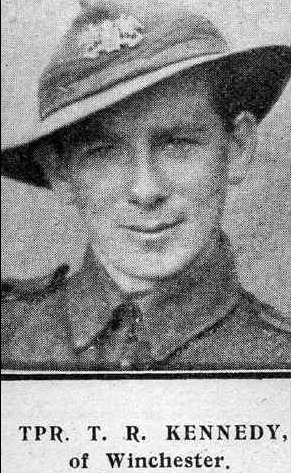 The name of Thomas Kennedy was heard again on Anzac Day, 1927. A Requiem Mass was celebrated at St Joseph’s Church, Temuka. The celebrant preached a very stirring sermon based on the Book of Wisdom (Chapter III, Verses 2-5). He pointed out that the Gallipoli campaign and later “gigantic episodes” would remain for all time a wonderful symbol of the age-old courage of men. He reminded the lads present that the enormous sacrifices made by the soldiers of New Zealand and other parts of the Empire were helping them to have brighter and better lives, and that all should render thanks to God, who had delivered them out of the hands of the enemy. The Winchester War Memorial which was unveiled in a touching ceremony on 23 May 1920. The proceedings opened with the Lord's Prayer, followed by the singing of the hymn "Lead Kindly Light" and the laying of wreaths by the school children as the names were read. 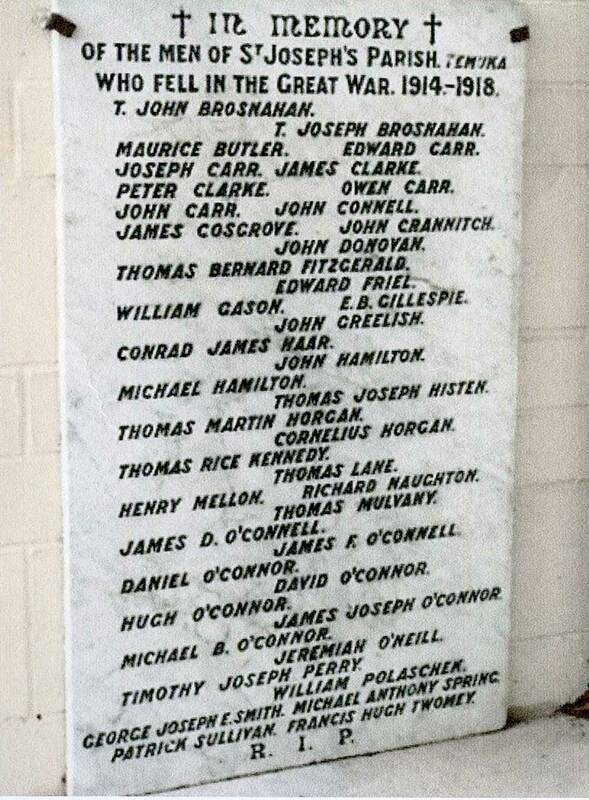 Several tributes were paid to these brave men who had given their lives in order that others might live in peace. In July 1920 at the largest gathering ever seen in the Victoria Hall, Winchester, when district soldiers were welcomed home and presented with medals, those who had made the supreme sacrifice were remembered by the presentation of certificates to their next-of-kin - Thomas was one of these men.